Payment must be received in full 6 weeks before your holiday is due to commence. £100 deposit to be paid when booking which will be used a the security bond. Sited on Haven’s Greenacres Holiday Park in Porthmadog, North Wales. 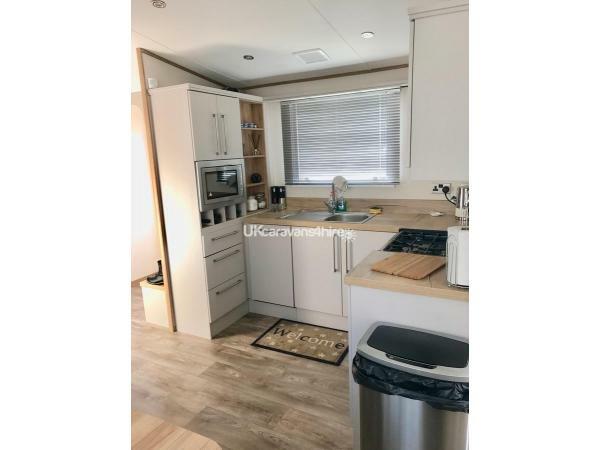 Our Lovely Double Glazed and Centrally Heated 2018 ABI Clarendon is excellently located on the sought after Red admiral, a large plot with a private parking space. A quiet location close to the nature reserve with beautiful views of the hills. 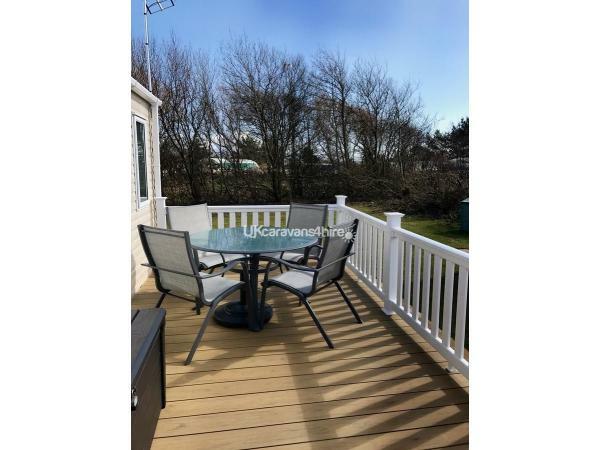 Large grassy area to the rear of the caravan and a lovely decked area front and side with patio furniture. Lounge consists of modern electric Fire, 43” Flat screen TV with Freeview, Dvd player. Chair and corner couch with lovely views and french doors that open onto the decked area. Kitchen/diner is fully equipped with a full size Cooker, Microwave, Toaster, Kettle. Fridge and freezer plus dishwasher too. Dinner service, cooking equipment, utensils, etc. Ironing Board , Iron and a Vacuum. Shower room with washbasin, shower and W.C.
Master bedroom/ensuite is a lovely master bedroom with dressing table, wardrobes, TV/DVD player and en suite toilet and was basin. Sleeps up to 8 people. Consists of 1 double and 2 single bedrooms plus a double size pull out bed in the lounge area. Bedrooms have wardrobes, bedside cabinets, mirrors. Main and second bedroom are fitted with TV - Dvd players and hairdryer in main bedroom too. We provide Mattress & pillow protectors, Duvets and pillows but bed linen, towels and tea towel are not. Greenacres has much to offer. Newly refurbished for 2018 heated Indoor pool with lots of bookable activities. Outside splash zone, Amusement arcade, Wi-Fi and Mini golf. Millie’s Cookies, Mash & Barrel Restaurant and bar, Show bar with lots of entertainment day and night for children and adults. Purchasing Funworks entertainment passes can access these. We cannot provide entertainment passes but these can be purchased directly from Haven. This can be done on site at reception on a pay as you go or weekly basis. On site there is also a hire shop, launderette, take away chip shop and grocery shop too. Greenacres has direct access to the Beautiful Black Rock Sands beach. The beach itself is wide and stretches over two kilometers long with amazing views of nearby Harlech and Criccieth castles. The breathtaking views of the mountains of Snowdonia National Park are an amazing backdrop to this idyllic park! Seasons: Off peak we have Monday to Friday 4 night breaks, and Friday to Monday 3 night breaks. Peak, School holidays 7 nights Saturday to Saturday. The Caravan will be ready for you from 3pm on your day of arrival and we ask that it be vacated by 10 am on day of departure. 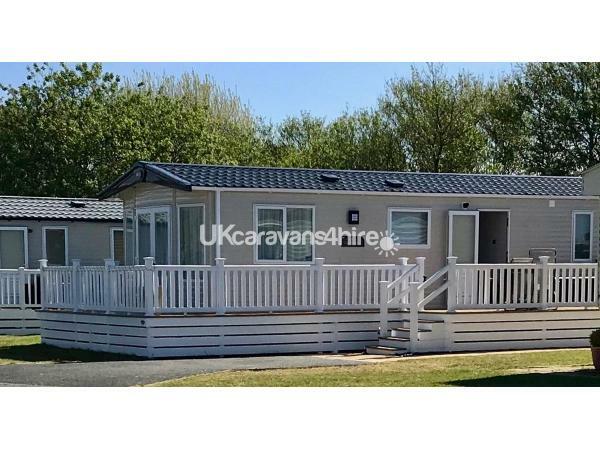 To book or enquire about this caravan please email or phone whereupon we will be happy to discuss your requirements. Should you decide to book with us, we would require £100 deposit which will be used as your security bond. The final payment in full would then be required no less than 6 weeks prior to the first day of your holiday. We advise guests to take holiday insurance, as monies once paid cannot be refunded. The Security bond would be refunded within one week of checking the Caravan for damage, losses or heavy cleaning requirements. The caravan will be clean upon your arrival and ask that it be respectfully left as it was found. For late bookings within 6 weeks of your holiday commencing we require payment of your holiday in full. No smoking and no pet’s policy too. Thank you. Additional Info: Greenacres has much to offer. Newly refurbished for 2018 heated Indoor pool with lots of bookable activities. Outside splash zone, Amusement arcade, Wi-Fi and Mini golf. Millie’s Cookies, Mash & Barrel Restaurant and bar, Show bar with lots of entertainment day and night for children and adults. Purchasing Funworks entertainment passes can access these. We cannot provide entertainment passes but these can be purchased directly from Haven. This can be done on site at reception on a pay as you go or weekly basis. On site there is also a hire shop, launderette, take away chip shop and grocery shop too. No reviews found. If you have recently stayed in this holiday home please leave a review, it only takes a few moments and will really help future guests when they are searching for holiday accommodation at Greenacres Holiday Park.